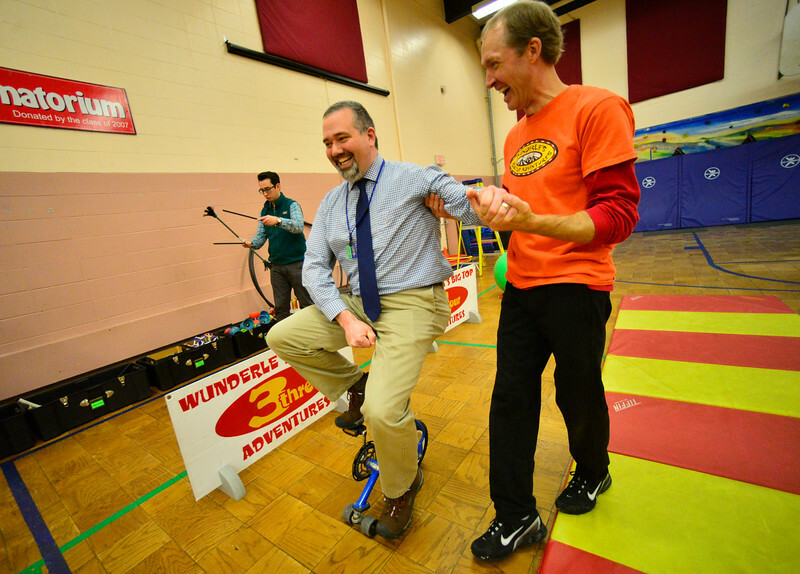 Troy Wunderle, of Big Top Adventures, not only teaches students at various schools in New England how to do circus arts but also encourages staff members to learn. “It’s not often we get to see adults play, it’s not often that we get to see adults fail, and both of those things are happening on a regular basis when adults step forward and are brave enough to try new skills,” said Wunderle about the staff members learning different circus arts in front of the students during their lunch. Troy Wunderle, of Big Top Adventures, not only teaches students at various schools in New England how to do circus arts but also encourages staff members to learn. “It’s not often we get to see adults play, it’s not often that we get to see adults fail, and both of those things are happening on a regular bases when adults step forward and are brave enough to try new skills,” said Wunderle about the staff members learning different circus arts in front of the students during their lunch.